The April 25 violence incident involved former police special-unit officer Uriel Benveniste, who is also a former prisoner on violent crimes, and who also has a long track record of violent conduct in the OccupyTLV camp. Restraining Order banning him from the camp was not enforced. And police apparently again failed to take action against him following the April 25 incident. The April 29 letter from Tel Aviv Police Commander came in response to an April 28 letter by Dr Zernik to Commander Sau,  which included the recording of an April 25, 2014, phone call between a senior Tel Aviv Police Intelligence Officer and a policeman on the ground in the OccupyTLV camp. [3-4] The phone conversation details evidence for various types of criminal conduct, and concern by the officer on the ground that such conduct may lead to a murder. In his letter today, Dr Zernik states that the incident of April 25, 2014, should be examined on the background of the Israel police conduct in the camp throughout the past year and a half. Moreover, Dr Zernik alleges that such examination is likely to lead to the conclusion that the Israel police in collaboration with the Tel Aviv Municipality are involved in the establishment of violent, lawless environment in the OccupyTLV camp. 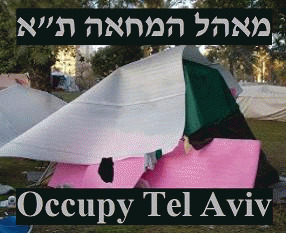 The OccupyTLV camp is the only camp remaining in Israel following the mass Social Protest movement that started in 2011. The recent case from the OccupyTLV camp follows a series of other cases, which raise concern regarding conduct of the Tel Aviv Police, relative to Social Protest and Civil Society activists. The Tel Aviv police are also prosecuting Tax Authority whistleblower Rafi Rotem on charges of insulting and harassing policemen on duty. The case of whistleblower Rafi Rotem has been going on for some 12 years now. Around 2002, then highly commended, senor Tax Authority intelligence officer Rotem complained of corruption of higher officers of the Tax Authority, involving undermining the investigations of NIS tens and hundreds of millions of tax liabilities by businesses related to organized crime, tycoons, and persons close to the authorities. Since his whistle-blowing, Rotem was subjected to harassment, intimidation, and retaliation by the Tel Aviv police, while the justice authorities have refused to fully investigate his allegations, and also refused to accord him protection, due to whistleblowers under Israeli law. As part of retaliatory measures, Rotem, who had won a number of commendations by the Israel police previous to his whistleblowing, has been subjected to false arrests, humiliation, and beating by police. No policeman has been disciplined for such conduct against Rotem, but now the Israel police are prosecuting Rotem for his words to such policemen during the incidents of his abuse. The case of Rafi Rotem has become a major cause of the Israeli Social Protest movement in recent months. Such transformation is astounding in a nation that was for most of its history a welfare state, which successfully absorbed in its early years about a million refugees from post WWII Europe and from Arab nations, and which in the early 1990s successfully absorbed another 400,000 immigrants from the former Soviet Union.